This name derives from the Hebrew “Yesha‛yâh / Yesha‛yâhû > Yesha'yahu" meaning “Yahweh is salvation, God is salvation”. The name is given to five people in the Old Testament: 1) The major prophet, son of Amoz, who prophesied concerning Judah and Jerusalem during the days of kings Uzziah, Jotham, Ahaz, and Hezekiah of Judah, author of the prophetic book by his name. Tradition has it that he was sawn asunder in the trunk of a carob tree by king Manasseh and that this is the incident referred to in Heb 11:37. 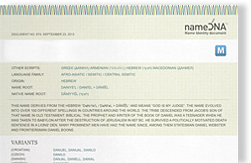 2) Son of Hananiah, brother of Pelatiah, and grandson of Zerubbabel. 3) One of the six sons of Jeduthun. 4) Son of Rehabiah, a descendant of Moses through Gershom, and an ancestor of a Levite treasurer in the time of David. 5) Son of Athaliah and chief of the house of Elam who returned with Ezra.